Ray Bradbury, famed science fiction writer, wrote a semi-autobiographical story Dandelion Wine in 1957. While I bought the book I was a teenager, and I never finished it; it wasn’t scifi. However the title has always stayed with me. 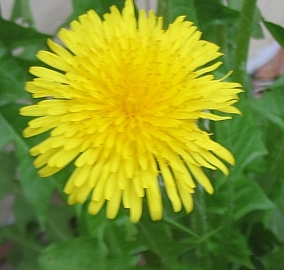 So this year, after many years of gardening, even writing a newspaper article on dandelions (You can read Dandelions, Weeds with History on my garden blog), the abundance of dandelions about seemed like an omen, so I’m game, or crazy, or something. I convinced Bill to pick dandelions with me. I’m going to make what has been called the ambrosia of wine. The first step was to find a recipe. The Internet abounds with them, take your pick. The next step was to pick the flowers. I needed two quarts of dandelion flowers to mix with one gallon of water. Tuesday was a great day to pick flowers, sunny, steady breeze, not too cold or hot; or at least, not until we started picking. Two hours picking proved how little those flowers actually are. It seemed to take much longer. Warning one: if you go picking, don’t pick in fields that have been sprayed in any way, or pick flowers too close to the road where exhaust could collect on them. Warning two: Insects love the flowers, too. You will find ants, honeybees, ticks, spiders, and assorted unknown fauna inside those lemon yellow petals; be wary. While picking, which involves much bending over, I found it easiest to pull the flower heads off between my index and second finger so I could easily gather a handful. This picking business is good exercise, but not as good as the long walk I gave up. However, picking is a simple procedure, do it anyway you want. Warning three: Fingers working on dandelions turn an interesting shade of yuk brown. Most of it washes away unless your nails get stained. Okay; hopefully the worst is over. I dutifully began to boil the water when Bill walked in and asked if he could make dinner around me. I said, “Just bring this water to a boil, move it off the heat, turn off the burner and stir these dandelions in.” Job done, I left the kitchen (whoopee!). Next the blossoms must be allowed to steep for twenty-four to forty-eight hours, stirring, oh, twice a day. This is the easiest part of the process. Once done steeping the blossoms, pour the liquid off through a strainer lined with a coffee filter or cheese cloth. Heat the clarified liquid to boil, add three pounds of sugar, six tablespoons of lemon juice, and six tablespoons of orange juice. (Or two lemons and two oranges; or the peel of two lemons and two oranges – see how adaptable this is?) Five or so whole clove can also be added. Once the mixture cools, add a tablespoon of yeast. Pour into a large glass, or stainless container, or ceramic crock. Cover and let this set for a week, stirring and skimming the contents daily until bubbles no longer form. Let the mixture settle for another day and then siphon (or strain) liquid and pour into bottles filling to 3/4″ below the cork. Cork and let mature for at least six months. So maybe for Thanksgiving dinner, I can present my homemade wine. More Mistakes: Don’t know yet, anything is possible in a new endeavor, I’ll let you know. Isn’t it lucky someone gave Bill a bunch of wine bottles a couple weeks ago? I think I’ll get two or three bottles cleaned and sterilized. Update: Friday night mixed all ingredients. This morning went down and stirred the mixture. It doesn’t bubble… it fizzes with thousands of tiny bubbles and has the most amazingly citrusy-green fragrance. Reprint of my post in Seven Night Writers.